I didn’t get a great sleep the previous night. Three Italians who were in my room went out to watch the Champions League semi final between Juventus and Madrid and came in just after midnight rowdy. Now, I don’t usually mind this…I would probably do the same at their age. I was just tired and my leg was starting to worry me. Was there something more to it than just muscle pain? The rest of the guys were dressed and having breakfast when I stumbled out of the room to make for the bathroom. They wanted to wait for me, they said. I was happy to hear this. I enjoyed company while walking. That was the last I saw of the Italians! It must have been 6.30am when we hit the road. 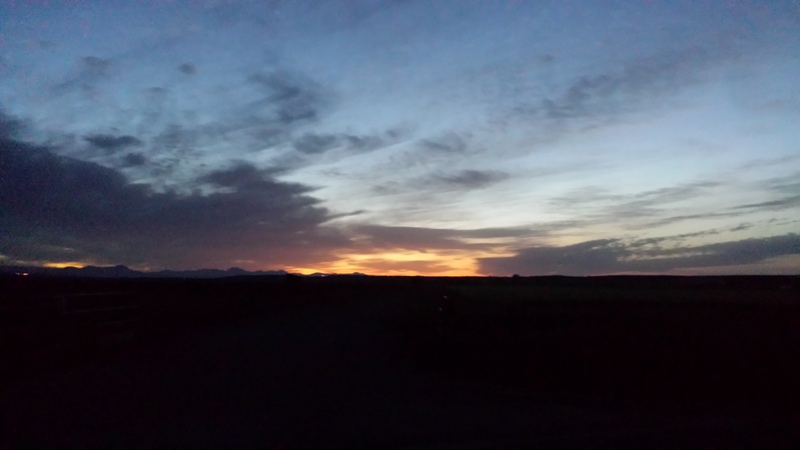 The sun was beginning to rise over the horizon. There was cloud in the sky but even at this early stage, it was set up for a warm day. There were reports in the Spanish news of temperatures reaching 35c in Leon this day and the next while Barcelona was due to hit 42c! Amazing, considering this pale Irish boy is used to temps not going over 25c! I had the Factor 50 ready anyway. I walked with Tina for the first hour or so and we pick up the pace, leaving the others behind. Franz was busy listening to his music while Tom and Caroline talk busily. Franz and Tina have walked numerous Caminos before and were already making plans to come back in 2016. They both have a great interest in the outdoors. Like myself, I guess. They had walked the Camino Aragones from Somport the previous year which peaked my interest. Tina and myself spent a while thinking of ideas on how to stop the infernal bed race, and how to stop pre-booking albergues! Many of our answers were left on the long road that we walked on! I’ll let you find them. 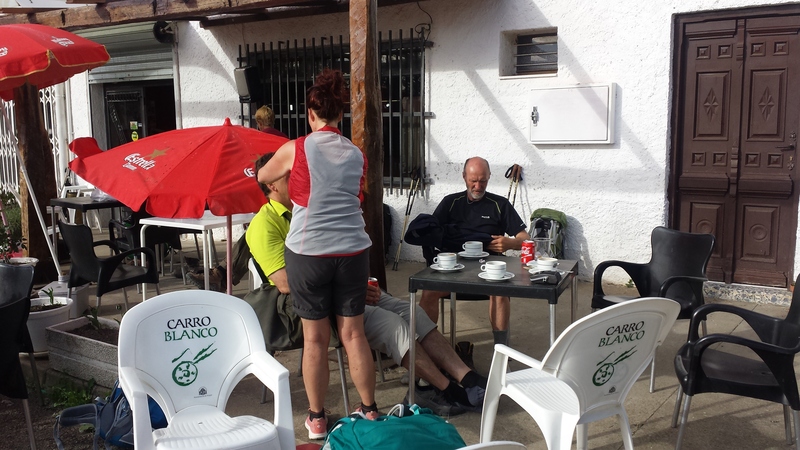 We eventually reach Mansilla de las Mulas and stop off at Albergue El Jardín del Camino for breakfast. We struggle to get inside as it is packed with pilgrims and locals starting off their day. On ordering, we took it outside to the table area. It was warm enough to take off the leggings on my bottoms. We all ate our breakfast quickly and moved on. The owners of that albergue must surely be busy for the summer. 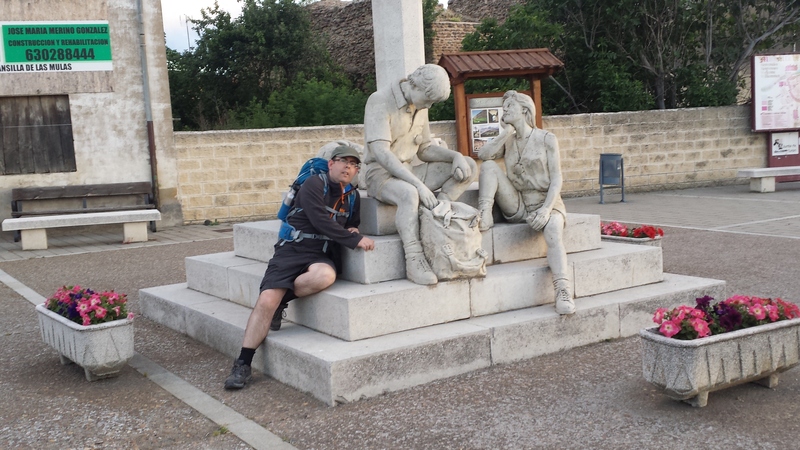 Before we left, Tina took a photo of me beside the monument of the three weary pilgrims. They sum up how all pilgrims feel after a long day’s walking. Mansilla is generally an end stage and has two large albergues. I stayed in the municipal further down the road in 2013 but not on this occasion. Next stop..Leon! 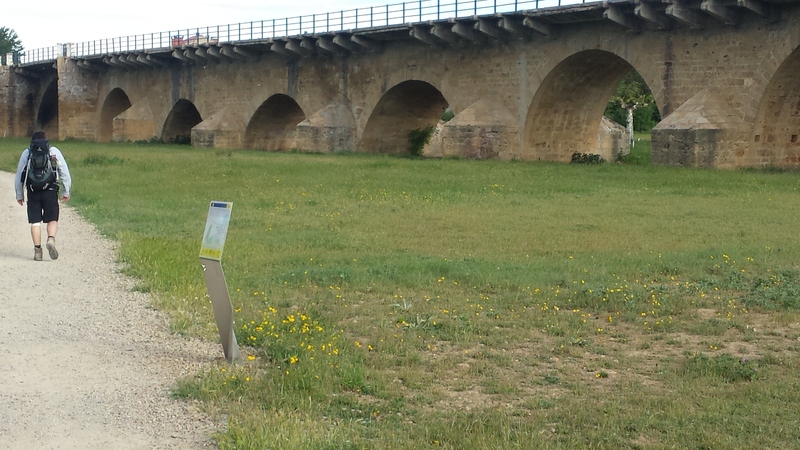 The walk from Mansilla to Leon is, well..how can I say this in a positive fashion?….well..uninteresting?! 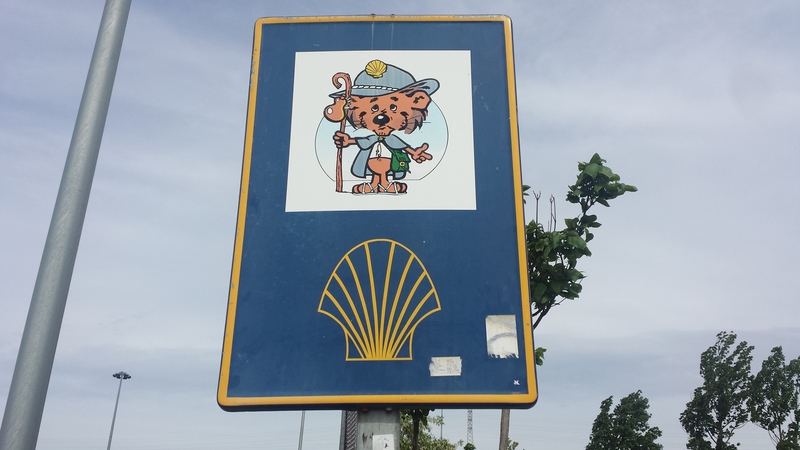 There is no great surprise that a lot of pilgrims bus into the the city centre, so they can avoid the industrial heartland that the Camino weaves through. The main concern I had was the amount of concrete I would be walking on. 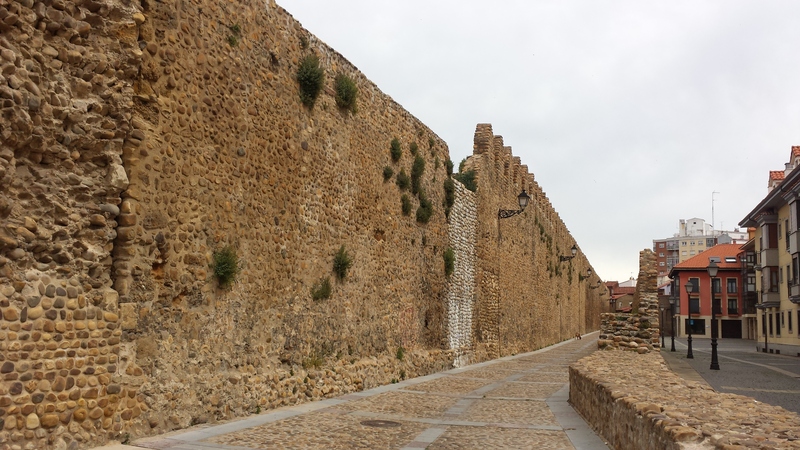 Previously, I had been walking on senda, rock, gravel, which didn’t seem to bother my feet. We stopped off at Villarente for another cafe con leche where I met Andreas enjoying a second breakfast. This cafe is owned by a chap who only played classical music and behind the counter he was joined by an Austrian pilgrim who stayed in the albergue adjoined to the cafe. Apparently, you can pay for your stay by serving breakfast! While relaxing, I wave to Mary as she storms past me walking at quite a pace. Determination personified! 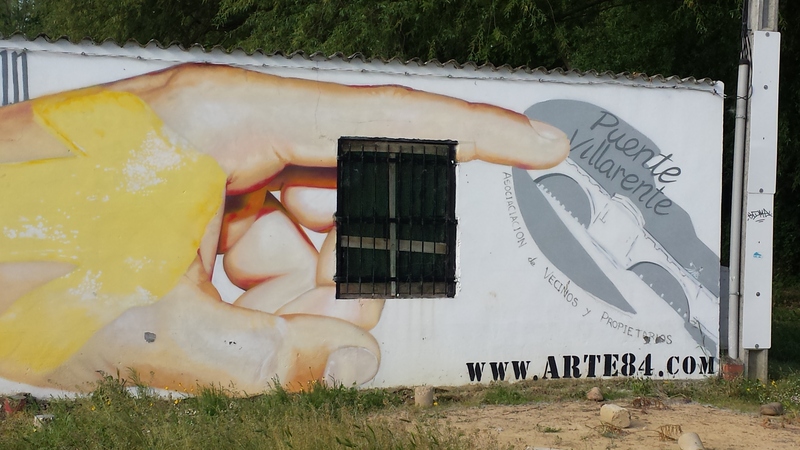 After Villarente, we walked along the main road and pass through suburbs and industrial areas. 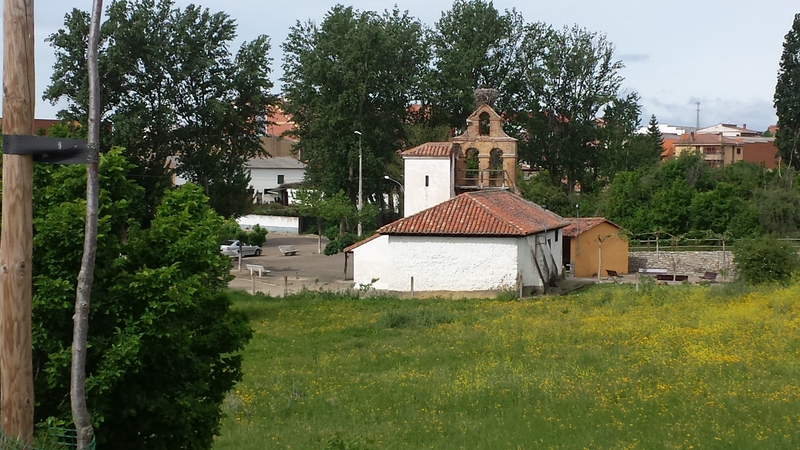 Arcahueja and Valdelafuente have albergues if you wish to stop short of Leon. But really, you would be crazy to do that. Leon is beautiful. You can see the first sight of it’s cathedral as you cross a bridge over the main road into the city. We weren’t far now. 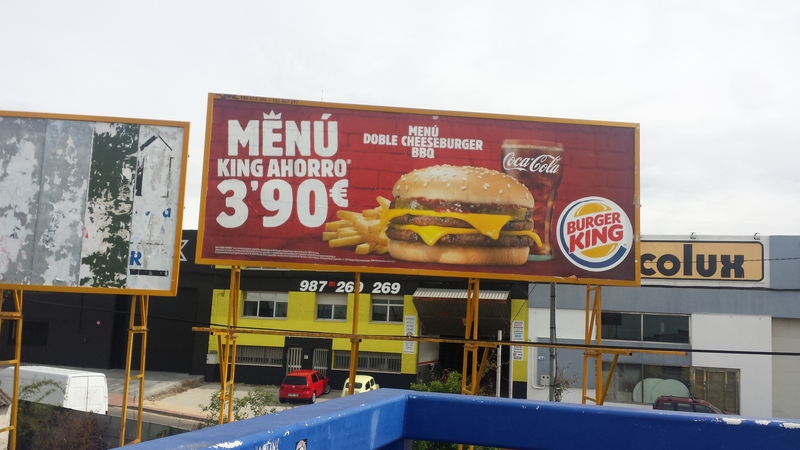 We also spot a large advertisement for Burger King. City life awaits us! The cathedral is majestic, standing tall as we enter the main square. We stop for a cafe con leche in place called “La Mas Bonita” which is right beside the tourist office. We just wanted to gather our thoughts and find a place to stay. The Benedictines albergue was a definite no, we all agreed. It was coming close to 1pm at this stage and I was getting eager to find the Correos and receive my euros which were wired to me. All I had was a code in a text and with my limited Spanish, I wasn’t sure how this was going to work. Or if was going to work at all. The owner of the cafe pointed us in the direction of a great little hostal called “Hostal San Martin” which is behind the main plaza. It cost me €30 for the night and at this point I was borrowing money from the guys. Ok, the Western Union transfer better work, I thought. I dropped my bag into the room and walked in the direction of the Correos. After a 20 minute walk, I found it and with a little translation help, I received some more funds to tie me over until I arrived home. I was happy now. I walked back in the direction of the hostal and met the guys for a drink. Franz suggested we go for a Burger King. I said I would love it (he had me at Burger! )..the other guys wanted to visit the Cathedral. I don’t usually eat McDonalds or Burger King in Dublin but I lapped it up, it just felt right. The food I had been eatting has been great, don’t get wrong, but I had been left hungry. The Easter Break..a chance to renew.. So I guess it's a thing now... . . The updated blog is now live. . Link in bio. Back home with the family for Easter, enjoying the good weather. . Happy Easter everyone! If you would like to contribute in any way to this blog, please email me @ clearskiescamino@gmail.com. I’d love to hear from you! Is the Camino Frances becoming too stressful?